How to Answer What major challenges and problems did you face? How did you handle them? 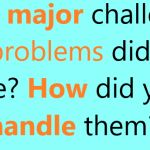 How to Answer "What major challenges and problems did you face? How did you handle them?" interview question. What would be your best answer for this question? … [Read more...] about How to Answer What major challenges and problems did you face? How did you handle them?